"With our chief delegate’s approval, and without any consultation with US delegation… we drafted an amendment to Article III, in order to lend more emphasis to development….Because my English was better than my fellow delegate’s I was asked to read it aloud…Keynes was characteristically quick to realise the ‘political’ significance of our amendment, which was…supported only by Peru and Norway…As he pushed his spectacles to the top of his nose and shuffled the various amendments that were upon the table, he picked out and expressed agreement with ours if we would accept a drafting change. The original text merely stated that ‘The resources and facilities of the Bank shall be used for the benefit of members’. In the amendment we submitted, we wrote a second paragraph as follows: ‘The Bank shall give equal consideration to projects for development and to projects for reconstruction…’ Keynes suggested ‘The resources and facilities of the Bank shall be used exclusively for the members with equitable consideration to projects for development and projects for reconstruction alike’. We were pleased with the word ‘equitable’ and that he put ‘development’ ahead of ‘reconstruction’. I quickly nodded…and the amendment was carried by consensus." 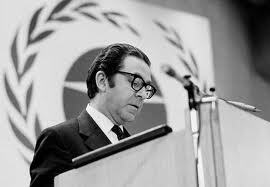 Urquidi then worked at the then Economic Commission for Latin America (ECLA, later with the addition of the Caribbean ECLAC), when Raúl Prebisch was the secretary general in the 1950s. For more on Urquidi go here. What do you think of this post? It appeared at a very Austrian blog, very afraid of hyperinflation and so on, but I'm really interested in the story. What happened in 1951 between the Fed and the Treasury?